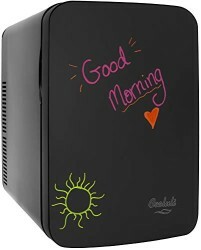 The Vibe-15LE Thermo-Electric Cooler/Warmer Mini Fridge by Cooluli puts the fun in functional-its blackboard front is also magnetic, bringing a whole new level of cool to the standard mini fridge. The versatile and useful blackboard front brings a classic, old-school Vibe to this modern mini fridge-it also helps organize and prep various notes and lists. The Vibe-15LE Thermo-Electric Cooler/Warmer Mini Fridge by Cooluli puts the fun in functional-its blackboard front is also magnetic, bringing a whole new level of cool to the standard mini fridge. The versatile and useful blackboard front brings a classic, old-school Vibe to this modern mini fridge-it also helps organize and prep various notes and lists. Use with any classic chalk or with liquid chalk markers (not included). Do not use with dry-erase pens/markers. The all-purpose Vibe is durable, efficient and stylishly compact and it goes from cooling to warming with one quick switch. The Vibe is perfect anywhere you need to store food, drinks, beer, snacks, breast milk, insulin, skincare, personal care and beauty products, medicine and other essentials. Its compact design features a roomy 15-liter capacity, and the molded foldaway top handle makes transporting the Vibe a breeze. Use it everywhere-the Vibe’s sturdy construction and sleek look match any décor, making it the perfect addition to your dorm room, home, countertop, office, hotel room, car, or on your next road trip or tailgate! Exclusive EcoMax Technology features Cooluli’s unique cooling system, making it ultra-powerful yet incredibly quiet and efficient. The Vibe is 100% environmentally friendly and uses no refrigerants or Freons. MAGNETIC + BLACKBOARD FRONT: The stylish yet practical blackboard surface is perfect for storing magnets, and keeping notes and memos handy-in dorms, offices, nurseries, and on road trips, vacation, and tailgate parties. Chalk not included.